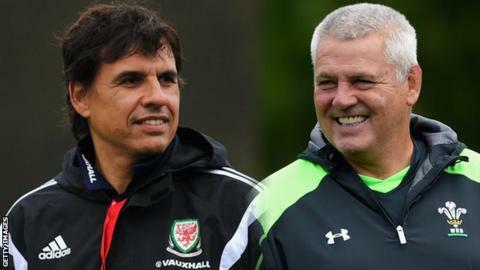 Wales football manager Chris Coleman and Wales rugby union head coach Warren Gatland have been shortlisted for coach of the year at the Wales Sports Awards. Coleman guided Wales to the finals of Euro 2016, their first appearance at a major tournament since 1958. Gatland masterminded a historic win over England at Twickenham in the World Cup, with Wales reaching the quarter-finals. Rowing coach Robin Williams has also been shortlisted for the award. Williams led rowing duo Heather Stanning and Helen Glover to a second World Championship gold medal in the women's pair event, capping a four-year unbeaten run for Glover, including an Olympic gold and two world titles. "These are three very special coaches, championed within their sports, and they rightly deserve their place at the very pinnacle of Welsh sporting excellence," chair of Sport Wales Professor Laura McAllister said. The winner will be announced at the Wales Sport Awards 2015 on Monday, 7 December at the Sport Wales National Centre in Cardiff. The winner of the BBC Cymru Wales Sports Personality of the Year 2015 will also be revealed in a programme available to watch live on the BBC Wales Sport website and on BBC iPlayer (UK only) from 20:00 GMT. Further coverage will be on BBC Radio Wales and BBC Radio Cymru.